So I think now of all times this is a good time to have a large allocation to metals, really for the first time in many years. — Jared Dilllian, The Daily Dirtnap, August 1, 2018. Dillian publishes his commentary for stock traders. He often makes recommendations on sentiment, meaning that when the sentiment is overwhelmingly negative he looks closely at the situation. That’s where he is now on precious metals. * The one really pleasurable thing about a precious metals bull market is going to be the complete humiliation of the irrational gold haters, which there are many. * Gold, and silver, and platinum, and palladium will go higher, in varying degrees. It may not happen today or next week or next month, but it will happen soon. He further notes that we now have tariffs, and huge quarterly deficits are getting revised higher all the time, which means tax revenues are falling short of expectations. As noted in Zimbabwe, a road too often traveled, interest alone on the national debt is projected to hit $1.3 trillion in 2022, only four years out. Dillian also asks: So why isn’t everyone bullish on gold? Because of the seven years of abuse. Because of the price action, which you got from the toilet store. Finally, Dillian says something that I’ve long thought: that the top in 2011 was an intermediate top, the prelude to a much higher high sometime in the future. For more information on The Daily Dirtnap, visit http://www.dailydirtnap.com/. 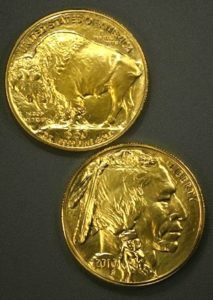 For some really good buys on gold, such as 1-oz pure Gold Buffaloes, see our Gold Specials Page. For some low premium silver items, such as junk silver coins and 100-oz. 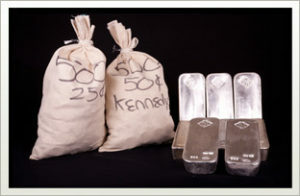 silver bars, see our Silver Specials Page.